Ash used bootyslam. It was supper infested. @ caucrasian , goddamnit. That as supposed to say infected as well... Thanks Obama! I put the "Re" in repost. All I need is "S-T-O-P"
OK...but why is Dat Ash there? @Invalid Chicken, wtf your not the real ic are you? @Comrade Vlad, click his name and check his score. Legit as legit can be. @a shiny haunter, Do you play competitive? @Invalid Chicken, gotta catch em all? @a shiny haunter, Have you tried Pokémon Showdown? It's run by Smogon, and the Smogon Pokédex has plenty of sets for Pokémon. Finally! I'm accepted by the gods of FuunyPics! I used to run around saying this when I was like 12 :( I was a horrible child. 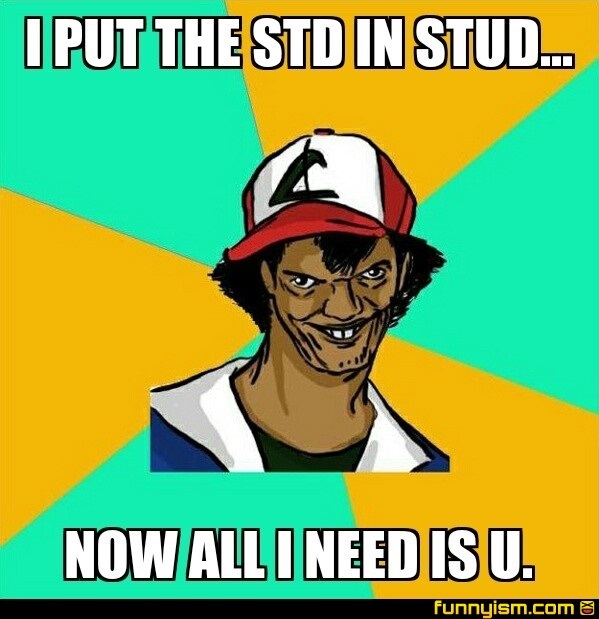 STD = Sexually Transmitted Disease, so uh, NO THANKS!! !